Kutztown, Pennsylvania): With the organic movement stronger than ever, Rodale Institute, the global leader in research on regenerative organic agriculture, honors three outstanding individuals for their innovations and dedication to the industry’s growth. 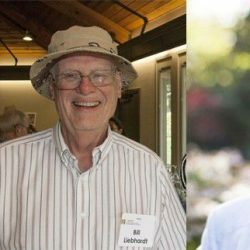 The recipients—Mas Masumoto, William Liebhardt, and Arran Stephens—will be recognized at the 8th annual Organic Pioneer Awards at Rodale Institute on September 8th, 2018. The celebration includes a full day of programming including an afternoon tour of the Institute and an al fresco lunch with the recipients, plus an intimate event and dinner held on the Institute’s historic 333-acre research farm, birthplace of the organic movement in the United States. The public is encouraged to join—find more event details and purchase tickets at RodaleInstitute.org/organicpioneerawards. Mas Masumoto, a third-generation farmer growing organic peaches, nectarines, and raisins on his 80-acre farm south of Fresno, California. He is the award-winning author of eleven books, including Epitaph for a Peach, Wisdom of the Last Farmer, and Changing Season. “I’m honored to be part of the Rodale ‘family of pioneers’ as we all work to build a healthy world,” says Masumoto. In 2013, President Obama appointed Masumoto to the National Council on the Arts. William Liebhardt, a soil scientist who has dedicated himself to better understanding various farming systems and their impact on soil fertility, is a former Director of Research at Rodale Institute and the former director of the Sustainable Agriculture Research and Education Program at the University of California, Davis. Sponsors of the event include Bonterra Wines, EO Soap Company, M&T Bank, Simply Organic, and others. Previous recipients of the Organic Pioneer Awards include Yvon Chouinard (Patagonia), David Bronner (Dr. Bronner’s), and George Siemon (Organic Valley).